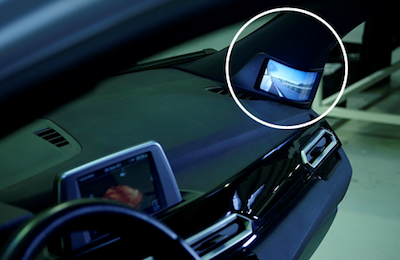 Apart from reduced fuel and maintenance costs, digital side-view mirrors can also increase safety by widening the field of view and by allowing augmented reality features to highlight hazards behind the vehicle. Also, any component that sticks out by 10cm or more has to undergo additional mechanical tests related to safety. So a more streamlined design based on digital mirrors can increase crash impact safety as well as avoid the need for this testing. The legal framework to replace mirrors in passenger vehicles is now in place and has been adopted by a large number of countries enabling the first production car announcements. Audi, for example, have established themselves as a pioneer in this area by announcing that the first all-electric Audi, the e-tron, will include “virtual wing mirrors”. The e-tron uses two non-rectangular 7 inch displays integrated into the door panels. 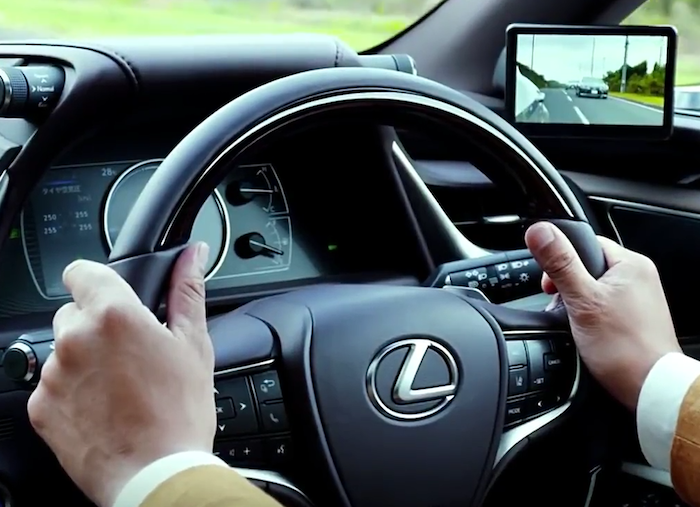 Lexus are also jumping ahead with their announcement that a new ES will go on sale in Japan in October with “Digital Side-View Monitors”. They are using two 5 inch displays mounted in front of the base of the A-pillars (see above). These first production implementations confirms that the display needs to be where the driver habitually looks for side-view mirror information. In fact, centrally located displays to represent right and left views are not permitted by UN Regulation No. 46 (the relevant international regulation). However, to integrate a display at the bottom of the A-pillar, at the top of the door or in the angle between the door and dashboard is a challenge, especially if the display is flat and square. This is why we are particularly excited that our partner Novares is showing a very elegant integration of a curved FlexEnable OLCD in the A-pillar of their Nova Car demonstrator showing the application of OLCD for digital mirrors. This is a great example of the desirability of being able to conform displays to the naturally curved surfaces of the car. Not only can the displays be made convex (as shown in the Novares example below) but they can also be made concave. They can also be very easily cut to non-rectangular shapes and they can even have holes made through them to accommodate mechanical knobs and switches. All this is done with maximum re-use of processes and materials that have already been automotive qualified for glass-based LCDs minimising the time, cost and risk of conformal display implementations in vehicle applications. If you are looking for a flexible display solution, get in touch with us at info@flexenable.com.